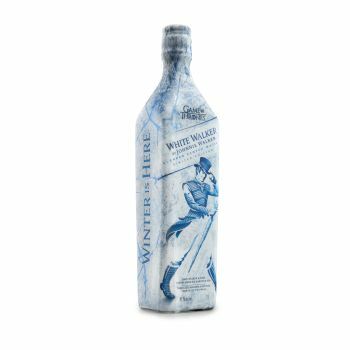 In celebration of the final season of the critically-acclaimed HBO series Game of Thrones, Johnnie Walker is proud to introduce White Walker by Johnnie Walker. Created by whisky specialist and blender George Harper, this unique, new limited-edition whisky was inspired by the most enigmatic and feared characters on the show – the White Walkers. Known by their icy blue eyes and led by the Night King, the undead army of White Walkers have emerged from the Frozen North bringing with them the chill of winter. At the heart of this innovative blend are single malts from Cardhu and Clynelish, one of Scotland's most northern distilleries. White Walker by Johnnie Walker is best served directly from the freezer and features pack technology that reveals an icy design when chilled.